We’re having a quiet week. I’m enjoying feeling well rested but a few times I’ve caught myself feeling anxious that we should be doing more. I know from experience that using the word should word is a sure sign I’ve disappeared from the joyful here and now and into too much thinking – never a good place for me to hang out for long. We spent most of yesterday at home apart from a visit to the park. C and J spent the rest of the day drifting happily between the garden and house. From time to time they’d ask me for things, but they mostly contentedly did their own thing. Looking back, it’s obvious the kids had had a great day (and of course learned heaps). But that insecure part of me (the schooled part) couldn’t help seeking reassurance. ‘Have you had a good day?’ I asked C at bedtime. ‘I’ve had a perfect day,’ she replied. Then she added, ‘No, not perfect. If it had been perfect I wouldn’t have had time to create’ (C’s word for the many things she does at the craft desk). 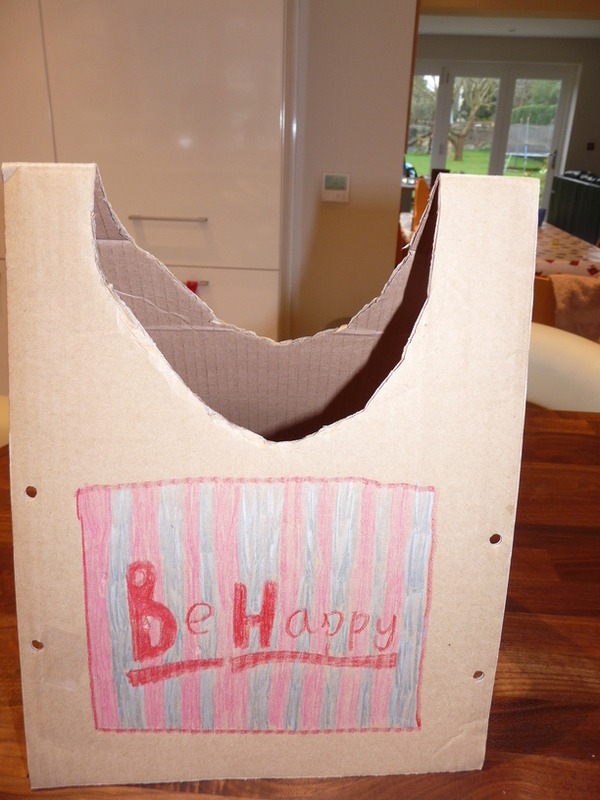 One of the creations she had time to make in her happily imperfect day – this Be Happy sandwich board – is a handy visual reminder for me!